It’s been three years since I’ve blogged at A Juggling Mom. Initially, I’ve been blogging solely to record Sophie’s milestones on another blog but decided to migrate it to this new blog as I thought it would be useful to share what I’ve learnt as a first-time working mum. I remembered that one of my first posts about my fibroid operation generated a lot of hits. The post was to share my experience where I had undergone not just one but two operations to have my fibroids removed. Till this day, I still squirm thinking about how painful the ops were and there are no where compared to a cesarean. I received many questions and comments from people all over the world to ask for help and advice. Though I’m no medical expert, I knew that my first hand experience is what people were looking for especially if they were recommended to have surgery. I was of course more than happy to share my experiences and gave my readers advice on what to take note of especially after a surgery, like diet and the dos and do nots. 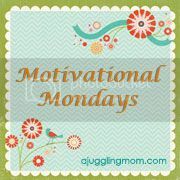 Two years ago, I started a linky party called Motivational Mondays and encouraged my readers to link up for anything that they want to be better in, be it a healthier lifestyle, being a better parent or spouse, etc because I believe in the power of encouragement and positive reinforcement. Committing myself to a weekly linky party also made me dig deeper to think about the areas that I want to improve in myself and I’m glad to know my friends and readers from the posts that they’ve linked up with. Last year, I joined an inspiring group of mums at World Mom Blogs. Besides being an group of international mothers who support one another in our motherhood journey, they are making a difference by creating awareness on social good issues like poverty, education for girls, and anything to make the lives of mothers and children better around the world. They have been nothing short of amazing and I’m so encouraged by their courage to make a difference with their words. As an advocate of the family, I’m also a Voice for Family, as a blogger for Focus on the Family and have been lending my voice to share ways on build happy and healthy families and share on topics like marriage and relationships. But my greatest take away is how I have been personally challenged to be a better wife to my hubby. More recently, together with a group of mum bloggers we decided to make greeting cards to support the Movement for the Intellectually Disabled of Singapore (MINDS). Though I’m no expert in making cards, the response have been so heartwarming. I’ve had friends and even readers who dropped me private messages to place orders and even went the extra mile to make a donation all in the name of charity. By the way, do look out for the upcoming post featuring a new batch of cards for purchase. I’m so thankful that this blogging journey is not just mine alone and I’m so thankful for the friendships that have been formed on this virtual space. But more importantly, I’m so humbled that this space of mine can possibly be an avenue of blessing and encouragement to those around me and even extends to those half way around the world. Thank you for dropping by my blog today and if you’ve been blessed by my blog, do drop me a note and let me know how I can improve it for you my readers 🙂 Do let me know what you like, or like to read more of and I hope to have more opportunities to do good with my blog. Do link up every Monday on what motivates you to be better be it a fitness goal, parenting, marriage, blogging etc. Share your recent post and encourage someone. Don’t forget to grab my badge and include it in your post after you have linked up and leave me a comment too. I host Motivational Monday every week and I hope that you can join me every Monday. Have a great week ahead! Thanks LuAnn. That’s how real life is right, the ups and downs in life 🙂 Glad to know you from Twitter. You’ve accomplished a lot these past 3 years. Thanks for being a genuine and supportive friend online, and off. I’m glad to have met you through blogging! Thanks for your friendship too Ai. Glad to know you in person and you’re doing a great job with your blog. Happy Blog Anniversary ! Ai is right , you have achieved alot for 3 short years 🙂 And you know what, when I see Hello Kitty these days, I think of you ! No kidding !